Along with other potential psychics he undertook the journey to Earth in 924 where further tests led to the eventual soul-binding in 925. From that point Nastase was recruited into the Administratum as an Astropath. He attained the ranks of Secundus, Prefect and eventually rose to hold Consulship for four years, helping to run the Adeptus Terra's advisory Senate to the Master of the Adeptus Astra Telepathica. 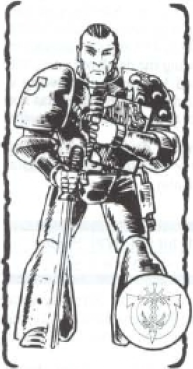 Following this he undertook four years' service with the fleet, a further two years with the Dark Angels Marines and was appointed as chief of the Macragge interstellar communications link under the jurisdiction of the Ultra-Marines (965). Nastase is now 76 years old (current year 987) but, thanks to his parentage, shows few signs of age. Nastase wears powered armour in combat and carries a force sword and laser pistol. Points value includes all psychic abilities including astropath abilities costed at 10 points each.